Here is a recent news article called “Tai Cheese Anyone?” that has interesting things to say: “A dairy farmer who believes a happy cow is a productive cow has discovered an unusual way to relax his herd and increase milk yields – T’ai Chi. 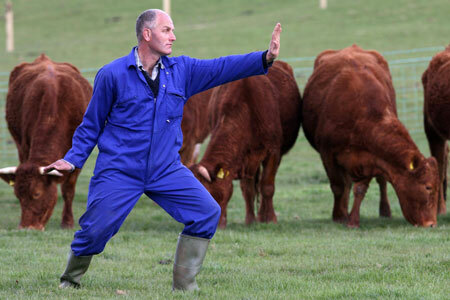 He performs the ancient martial art in front of his 100 cows every morning to get them in the right moo-d to produce lots of milk [Tai chi is a Chinese martial art involving a series of slow, controlled movements which can help developing strength, balance, posture and a feeling of calm.] 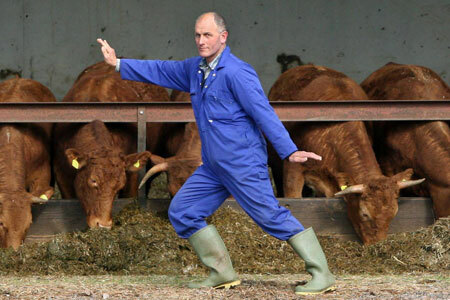 The 44-year-old organic farmer visits the animals at 9am each day to run through his ten-minute routine of slow movements and breathing techniques – dressed in his distinctive overalls and wellies. He said: ‘Tai chi is all about leaving your problems behind and getting into a better zone and my mood definitely transfers to the cows. Like all animals, they are very receptive to human emotions and can sense feelings such as relaxation, calmness and happiness. Some people think what I do is ridiculous but I have some very content cows and I would do anything to keep them that way. As any good dairy farmer will tell you, a happy cow is a productive cow.’” (From the Internet on Sunday, April 13, 2008 at http://www.metro.co.uk/news/article.html?in_article_id=142597&in_page_id=34). I think this is an interesting story. There is an idiom in Chinese that goes like this “Duei Niuo Tian Chin”or, “Play a lute to a cow”. In the West an equivalent expression is, “To throw pearls before swine.” In ancient time people thought animals were very simple beasts; they couldn’t understand human being’s feelings and they didn’t have emotions. However, now that we know more about animals we know that is wrong. Anyone who has ever owned a family pet like a dog, cat or rabbit, knows this. Just as the Tai Chi farmer said, “Like all animals, they are very receptive to human emotions and can sense feelings such as relaxation, calmness and happiness.” So to “play a lute to a cow” or “play T’ai Chi to cows” is not a ridiculous idea anymore. I’ve also heard of some farmers playing music to their cows every day and others giving their oxen massages. There also has a story in Buddhism that goes like this. After Sakyamuni Buddha had been teaching for a while his followers became more numerous. His cousin Devadatta saw this and began to plan to kill Buddha and substitute himself in Buddha’s place. So he sent eight assassins to Buddha when he was sitting in a cave meditating. But when the eight assassins saw Buddha’s stately and calm face they put down their knives and repented to him. Devadatta tried again. This time, when Buddha was walking by beneath a hill, he rolled a huge rock down from the top, but this only succeeded in hurting Buddha. The third time, Devadatta drove an elephant to madness by giving it a lot of alcohol to drink. He hoped it would trample Buddha while he was walking about begging for food. Devadatta thought to himself, “An elephant is not as same as a human being, so an elephant shouldn’t be influence by Buddha. This time I will succeed.” But when the elephant began his rush, he senses a calm and peace feeling from Sakyamuni Buddha. Unexpectedly, the elephant stopped his mad trampling run and became very gentle. So we can see from this story that it’s not just human beings that can sense a calm and peaceful feeling from the Buddha. Even a drunken elephant can sense it. For me Tai Chi isn’t just a martial arts or exercise. It is also a moving meditation. Even after practice it for twenty-four years and doing same thing every day, I still enjoy it every time I practice it. When I focus on the movements and my breath, I feel calm and peaceful. This feeling can also influence other beings. I’m not just benefiting to myself but also being beneficial to all the other beings around me.